By clicking "Join us!" you are giving Citizens' Climate Lobby and Citizens' Climate Education permission to send you email including information about CCL/CCE and how you can volunteer and support our work. You can unsubscribe at any time by emailing gro.y1555755492bbole1555755492tamil1555755492csnez1555755492itic@1555755492ebirc1555755492sbusn1555755492u1555755492. Reposted from Carbon Tax Center. Mild stuff since the time of Teddy Roosevelt — or the dawning of The Enlightenment — but relatively bold in the current era of Republican denial of science and dismissal of considerations that might interfere with short-term profit. Weak tea, to be sure, but the point isn’t the resolution’s text but its existence. A small flag planted in an otherwise barren landscape. 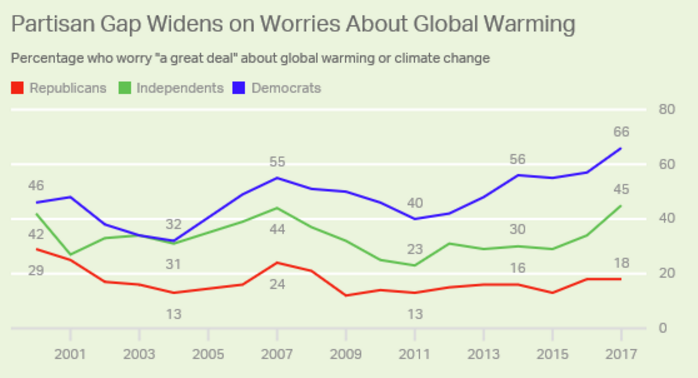 More Dems and Independents “are worrying a great deal about global warming,” reports Gallup. But not Republicans. And barren it is, on the GOP side. The Gallup Organization this week released new poll data indicating that amidst an upsurge in Democrats and self-declared Independents who “worry a great deal about global warming,” the share of Republican worriers is stalled below 20 percent (see graph at left). That’s less than the rate a dozen years ago, before the Koch Brothers launched their insidious campaign to cloak denialism in pseudo-scientific respectability and ensure that GOP office-holders shield fossil fuel interests from regulation. Note that our Polls page has more on the Gallup findings along with new and more encouraging data showing growing support for carbon taxes, from the National Survey on Energy and Environment (NSEE) from the University of Michigan and Muhlenberg College. If you live in one of the 17 districts represented in the map above, write to your Congressmember expressing appreciation and support for participating in the March 14 resolution. If you live in one of the other 224 districts represented by Republicans, write to your Representative and urge/insist s/he sign on. If you live in any of the 194 districts represented by Democrats, let your representative know about the resolution and urge her/him to reach across the aisle to support the 17 signers — particularly those from their state. As you write your representative, you may want to consult FiveThirtyEight’s listing of your district’s Trump-vs.-Clinton vote from last November. It shows 21 districts where Clinton outpolled Trump but with a Republican member who hasn’t signed the resolution; they may be more amenable to suasion than other GOP representatives. At least as important, join and support Citizens’ Climate Lobby, which since 2009 has been organizing to create political will for carbon taxes and which played a major role in both the 2015 and 2017 resolutions. A new CCL Web page on the Republican Climate Resolution makes it easy to take the first two steps outlined above. Charles Komanoff is co-founder and director of the Carbon Tax Center, which was founded in 2007 to advocate for a tax on greenhouse gas emissions.